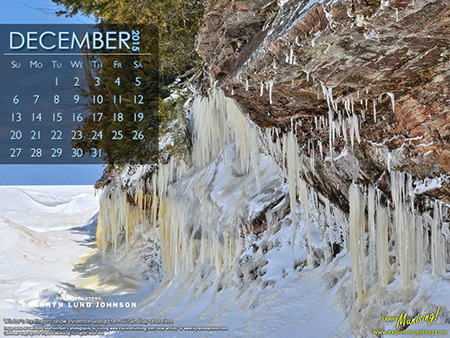 Our free December calendar for your computer screen background is now available to download. It features winter scene along the icy shore of Lake Superior. Photo by Kathryn Lund Johnson – www.kljnaturephotos.com. Posted on Monday, November 16th, 2015. Kick off the holiday season with a Santa’s parade, tree lighting, photos with Santa & friends, hot cocoa, drawings, old-fashioned wagon rides, music and business decorating contest. For more information, please call 906-387-2138. 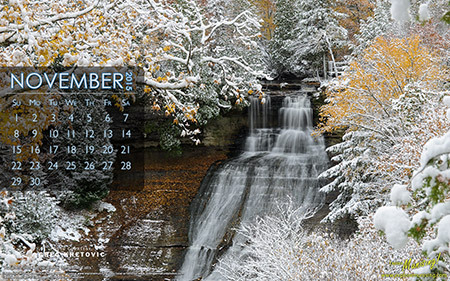 Our free November calendar for your computer screen background is now available to download. It features an autumn snow scene at Laughing Whitefish Falls. Photo by Greg Kretovic of Michigan Nature Photos. Northwoods Resort, located in AuTrain, Michigan’s Upper Peninsula, known for being a 4-season vacation destination. 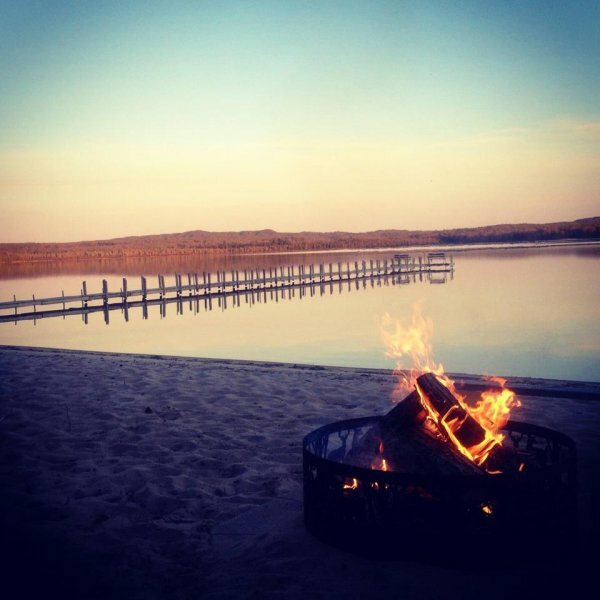 Family owned and operated for many years, the resort has become a favorite for those visiting Alger county coming back year after year–cultivating memories for generations. Northwoods Resort and their Canoe and Kayak Rentals is a popular destination for summer guests seeking rest, relaxation and all that Alger county has to offer. Winter and fall enthusiasts take advantage of the resort’s accessibility and well-known superior and well-maintained trail conditions for ATV and snowmobiling. 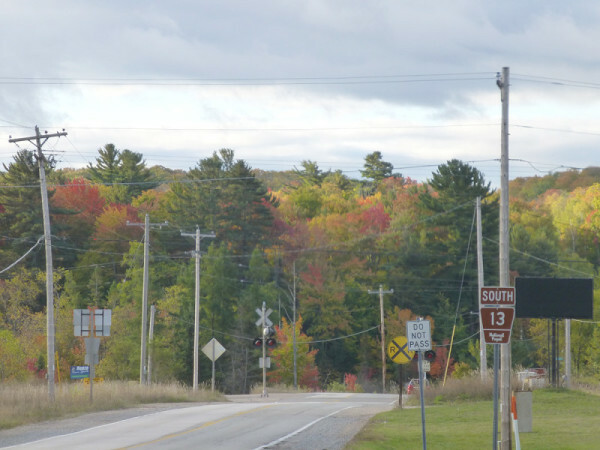 AuTrain, located in Alger County, has a population of just over 1,000 township residents and is located just south of M-28, the U.P.’s main northeast/west route on the shores of Lake Superior. Munising is just 15 minutes east and is home to Pictured Rocks National Lakeshore, Grand Island National Recreation Area and Hiawatha National Forest. Pictured Rocks Boat Cruises provides a narrated cruise to view the historic rock formations, or for those more adventurous guests who desire an “on the water” experience, Uncle Ducky Kayak Tours offers a host of daily paddle trips. 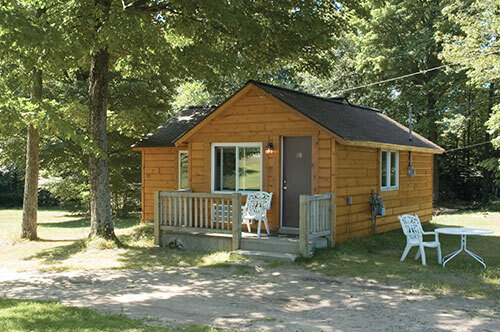 Northwoods’ main resort is comprised of individual cabins that range from one & two bedrooms to a large four bedroom log cottage…all fully furnished. 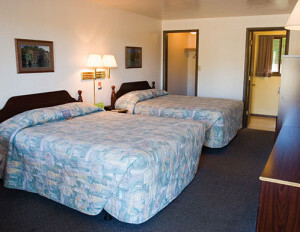 The Northwoods décor is rustic, comfortable and inviting, while providing guests with up-to-date conveniences of home. Several cabins have working gas fireplaces adding to the cozy, warm atmosphere. Friendly staff is always available to assure cabins are clean, comfortable and to help with any questions you may have to make your stay memorable. Thursday’s pot luck night is a favorite where guests share their day’s adventures…perhaps telling a few fishing tales while making new friends and getting reacquainted with past ones. For a full description of cabins and rentals, go to www.northwoodsresort.net. Winter 2015/2016 and Summer 2016 reservations are now being booked. Views of AuTrain Lake are spectacular, and the lake is directly accessible by several of the cottages. The resort has cabins on both sides of H03 (a narrow winding paved country road providing a route from M28 to M94 – see resort map.) Guests without direct cabin access to AuTrain Lake can easily enjoy the sandy beach, complete with picnic table and chairs, as well as the dock with swim raft. The boat livery has a variety of options including motor boats, row boats and pontoon boats for guests to enjoy a day of fishing or just being on the water. 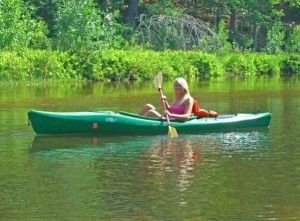 Northwoods Resort’s main office is also where you will find Northwoods Canoe and Kayak Rentals. Three different AuTrain River trips are available where you can enjoy a fun, relaxed, lazy river paddle for 3-5 hours, depending on your choice of distances. This is a family friendly adventure and offers a variety of kayak options for either 1 or 2 people. Old Town canoes, known for their stability, will easily accommodate 2 people. For a complete listing of options, go to www.paddleautrain.com. Lake Superior’s AuTrain Bay highlights a clean sandy beach and is just a few minutes drive from the resort. Posted on Monday, October 26th, 2015. We’re happy to announce we’ve added two new web cams to our website courtesy of Jamadots. 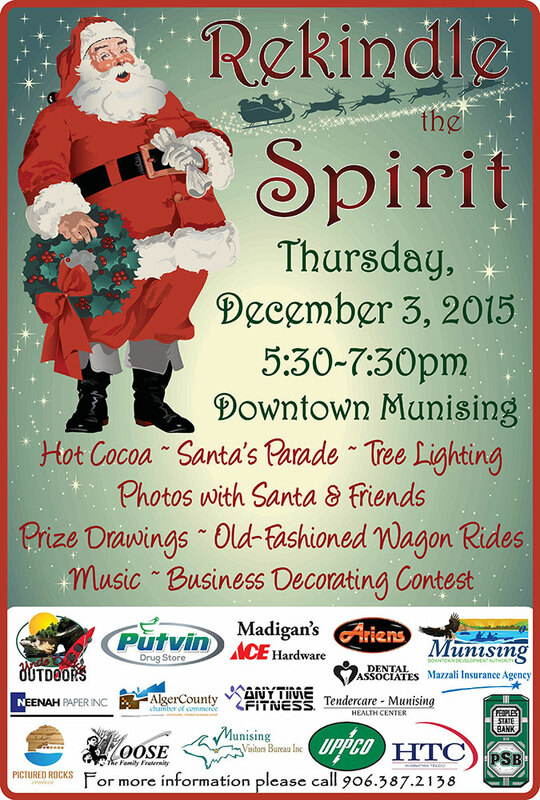 The cameras are located in beautiful downtown Munising on Superior Street. They look to the southeast and the southwest so you can get great views of what’s happening in our area. Visit our web cams page and then follow the links! Posted on Thursday, October 15th, 2015. Holiday Inn Express, located in Munising Michigan, is one of the area’s finest four-season lodging properties. Holiday Inn Express is situated high atop a bluff overlooking Lake Superior located outside Munising city limits heading west on M28. Just minutes from Munising’s centrally located boat marina, Bayshore Park and Pictured Rocks Boat Cruises, this property boasts both lake and hillside views. 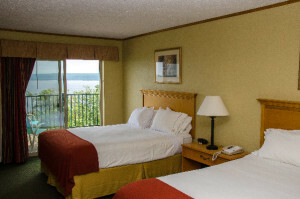 Holiday Inn Express’s lakeside rooms are luxuriously appointed and provide a breathtaking panoramic view of Grand Island, Munising Bay and the beginning of the Pictured Rocks National Lakeshore shoreline. The massive wood exterior is breathtaking and provides casual luxury in a gorgeous outdoor setting. The breakfast room is the perfect way to start your day with majestic views of Lake Superior. A meeting room is also available on premises. 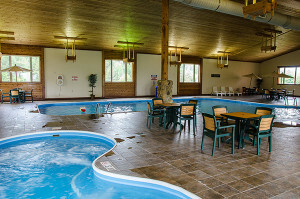 A family friendly indoor pool, hot tub and sauna help you relax after a day of enjoying nature’s surroundings. The friendly staff will assist in making your stay one to be remembered. The rear hilltop view, with chairs, is perfect for relaxing and enjoying Lake Superior’s water traffic. Embark on a Pictured Rocks Boat Cruise, a 3-hour cruise showcasing the incredible rock formations. Seaberg Pontoon Rentals and Superior Pontoon Rentals each provide a self-guided Lake Superior cruise to Grand Island’s east shoreline and Pictured Rocks shoreline. Grand Island Ferry shuttles bikers, hikers and campers to the Grand Island National Recreation Area. Dog sledding, snowmobiling, ice climbing, snowshoeing and cross-country skiing are among winter’s favorite activities to enjoy in this U.P. snowy wonderland. February’s Ice Climbing Festival hosted by Downwind Sports brings winter enthusiasts from all over the world to experience ice climbing. Dogsledding can be experienced firsthand at Husky Haven Sled Dogs in Shingleton (just 15 min. east of Munising). Enjoy kennel and educational tours to experience a “Mushing Adventure” with dogs that have actually run the Iditarod Dog Sled Race. No matter what the season, Holiday Inn Express is an exceptional lodging choice to help you experience Munising, Michigan and Alger County for your vacation destination. Reservations are strongly encouraged. Visit ExploreMunising.com for a downloadable map with hotel location. Posted on Saturday, October 10th, 2015. Alger Falls Motel & Rental Cabins, located in Munising, Michigan, is a family owned and operated 16-unit, including 2 housekeeping cabins, property. Clean, comfortable and conveniently furnished with coffeemaker, microwave, refrigerator, electric heat, air conditioning and free wireless Internet, this 16-unit motel is nestled into the hillside framed by trees that provide a picturesque backdrop of scenery. 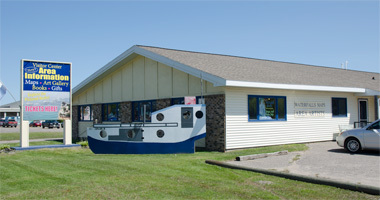 Alger Falls Motel is located just minutes from local attractions — Pictured Rocks Boat Cruises, Uncle Ducky/Paddling Michigan Outdoor Adventures, Sydney’s Restaurant, Dogpatch Restaurant, Seaberg Pontoon Rentals, Superior Pontoon Rentals and a host of others. A four season destination, Alger Falls Motel & Rental Cabins is home to the western gateway of the Pictured Rocks National Lakeshore. Hiawatha National Forest, Grand Island National Recreation Area, and Alger Underwater Preserve are among the other natural attractions that bring folks to Alger County. Exploring the Pictured Rocks National Lakeshore, you will travel west along H58 for 58 miles. Designated areas for hiking, waterfall exploration, sand dunes, and AuSable Lighthouse are among some of the favorite stops. Waterfalls are easily accessible, many with a short 10-minute walk. For those looking for a more challenging day of hiking, take the trail leading to Chapel Falls and Chapel Beach, continuing on to Mosquito Beach and Mosquito Falls for a total of 9 miles. The road leading to the trailhead is marked “Chapel Road” and is a gravel access road to the trailhead/parking area. At the Explore Munising Visitor Center you will find waterproof maps that detail the shoreline, complete with photos, name recognition and location of the individual rock formations nicknamed the “painted rocks.” Maps can be purchased at the seasonally operated Visitor Center or purchased online at exploremunising.com. Once the snow arrives, H58 is no longer accessible by car, but it is a snowmobiler’s paradise. Maps are available with clearly marked snowmobile trails where you can enjoy miles and miles of wintertime adventure. Alger Falls Motel has ample parking for snowmobile trailers. Two housekeeping cottages with fully equipped kitchens are available and are the perfect choice after spending a day of fun on the trails. Accessibility to the snowmobile trails brings guests back time and time again throughout the season. The rental cabins/cottages sleep up to 10 guests. Make Alger Falls Motel and Cottage Rentals a great lodging choice for your next vacation! Fall’s Festival of Color has Arrived! Posted on Thursday, October 8th, 2015. The Upper Peninsula’s northern hardwood forests have a variety of tree species. The predominant ones are sugar and red maples, red oak, birch, and aspen. We also have tamarack, or larch, which are coniferous trees that drop their needles each year when they turn a golden yellow. 2015 has brought about the change of colors approximately a week or two later than usual. This year the Upper Peninsula experienced a dry summer with above average temperatures. Recently temperatures have brought cool nights and lower daytime highs. Warm, dry weather with extended droughts or moisture deficits, yields color that is not as vibrant, is short lived (a week or so) and the timing can be delayed a week or more. Adequate moisture yields a longer period of leaf color. Sunny days create more vibrant leaf color. Leaf color is less vibrant (more dull) with several rainy or overcast days in a row when the leaves are turning color. Cool nights with temperatures in the 40s and low 50s, but not freezing, with daytime highs in the 60s and 70s tend to retain leaf color longer, and the colors are more pronounced, especially if the days are sunny. Freezing overnight temperatures and early frost will slow color. Leaves will turn brown and drop. Exploring the Upper Peninsula at any time of year is a treat. Hwy 13, M94, and H58 are popular color routes. These tree-lined routes provide a canvas for beautiful fall foliage. Visit www.exploremunising.com for lodging and restaurants in Munising, Michigan and Grand Marais, Michigan. Posted on Wednesday, October 7th, 2015. 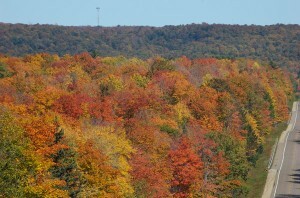 The fall colors are starting to show themselves around the Munising area. Here’s a local capture east of Munising, in Wetmore.